The groups for the 2019 Africa Cup of Nations have been officially drawn and Stuart Baxter’s South Africa are in the Group of Death for the continental showpiece. Bafana will be in Group D alongside Morocco and Ivory Coast and neighbours Namibia. Hosts Egypt will effectively battle it out with DR Congo for top spot in Group A, with Uganda and Zimbabwe completing the group. Other interesting groups are Group C, featuring Senegal, Algeria, Kenya and Tanzania and Group F- Cameroon, Ghana, Guinea-Bissau and Benin. Nigeria appear to have got a straightforward group- the Super Eagles have been drawn alongside Guinea, Madagascar and Burundi. 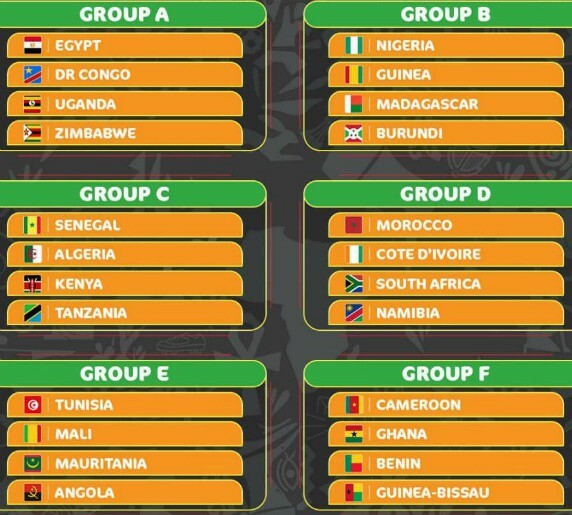 AFCON 2019 will be a 24 team tournament, played between June 21 and July 19 in Egypt, the first time in the history of CAN that it’s being played as a summer tournament than the usual January/February time.